At last! The newly-repackaged Simpy Balanced line showed up at my local Target, though there wasn't exactly a plethora of choices. 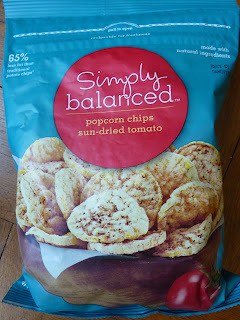 It was mostly little snacky things like this, and it appeared that virtually all of the current Simply Balanced line is simply repackaged offerings from Archer Farms. But, apparently, they're only the healthiest choices from Archer Farms' foods. What struck me about these chips initially was the decided lack of flavor, sun-dried tomato or otherwise. Fortunately, I had been in the mood for something very light and airy when I tried them. They really are low-fat, and miraculously, they've only got 4% of your RDA for sodium. In a way, salt is the dominant flavor of these chips. I'm really not a fan of raw, fresh tomatoes, but I often find tomato-flavored things palatable. However, I barely taste the tomato flavor of these chips. I really wouldn't have minded them being twice as pungent as they were. They are made with popcorn, but they taste and feel like old-school Quaker rice cakes to me. I've tried other brands of popcorn chips that taste and feel a little more exciting than these things. The texture is nice...if you like the texture of rice cakes. They're a good size for snacking and the bag is a decent value, especially for something so relatively not-bad-for-you. I personally would have appreciated a little more flavor, a little more zest...a little more kick, if you will. But I'll just chalk that up to me picking the wrong flavor.